During this time of year, the hills of eastern Ohio are covered in snow, frozen waterfalls, and massive icicles. Most of us enjoy spending these cold winter days indoors next to the fireplace or with the furnace working overtime. So with their thick wool coats, are sheep actually keeping as warm as you think? What about goats that do not have those nice thick coats? Are they just used to the cold? During the winter, extreme temperatures, precipitation and wind can create substantial problems when raising ruminants. Contrary to the idea that our livestock can fair the cold better than we can, they actually feel the same temperatures that we do. The Lower Critical Temperature (LCT) is the temperature threshold for the amount of energy it costs to remain warm for livestock and other mammals. These temperatures are affected by coat condition, wind chill, and rainfall. Sheep will often handle cold temperatures better than goats, so long as they have their wool coats. If they have been sheared recently, sheep will be more at risk for cold stress. As temperatures drop, ruminants will eat more, and their feed will have to be adjusted to make up for the loss in energy. A good way to determine how much more to feed is to add ¼ lb. of total digestible nutrients for every 10°F below the LCT. If temperatures outside are 0F and the LCT is 25°F, you would want to add 2.5 lbs. of supplemental feed, such as corn, oats, sweet feed or complete pellets, to maintain body condition. Quality hay can generate additional warmth when digested as the breakdown of cellulose produces heat. 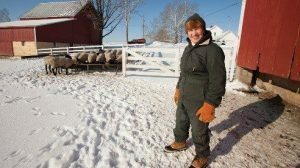 Full fleeces also work well to keep sheep warm when temperatures drop below freezing, but if precipitation and windy conditions occur or temperatures drop below 0°F, even sheep with full fleece will undergo cold stress. Sheep and goats should have access to shelter during the winter months. A three-sided shed works well since these structures provide protection from the wind and precipitation. Ideally, these shelters should face south for additional warmth in the winter months and block out the cold brought in from the northerly winds. Wind speeds above 5 mph can cause cold stress in youth and adults alike. Hay stacks, wind fences, and shelter belts can repel wind and reduce risks of cold stress and hypothermia. Ruminants know when they are too cold and need to seek shelter, so you should not have to worry about rounding up sheep and goats when temperatures drop below 0°F. Enclosed structures used for winter housing should be checked frequently and be well ventilated since ammonia can build up and may result in respiratory issues. Caution should be used with heat lamps, which should be placed well out of reach of the animals in the structure. Also make sure that feed lots have adequate space for animals – ewes and rams require 8 square feet of space while lambs and kids need 6 square feet. Extra care should be provided for pregnant and young ruminants. Newborns are more susceptible to hypothermia since they are coated in amniotic fluid until cleaned. Hypothermia can inhibit immune function, increasing risk of disease. 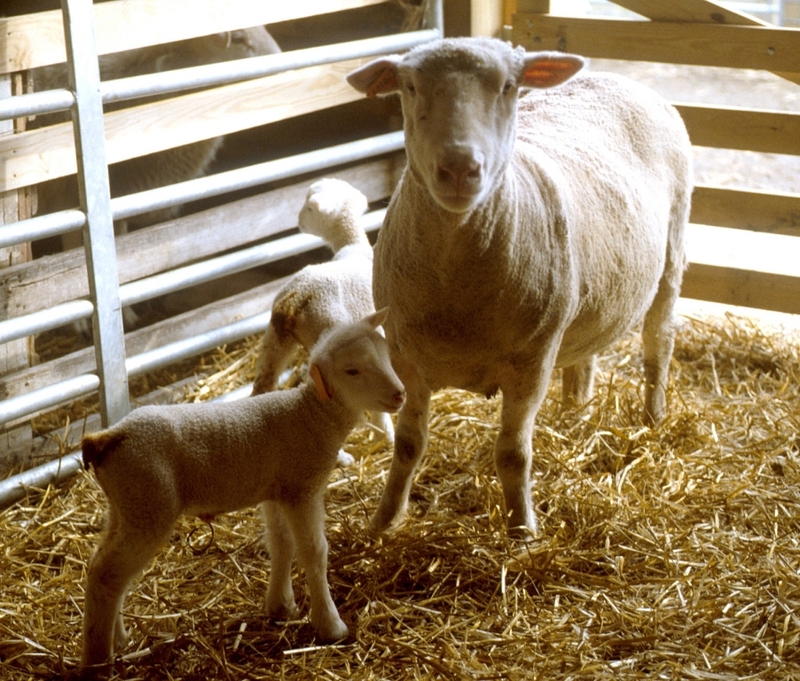 Frostbite and cold stress may also occur, so it is important to provide pregnant small ruminants to barns that are sanitary and warm for lambing or kidding. As with any time of year, feed, water, and body condition score along with diseases and parasite status should be checked on a regular basis. Remember, just because it is winter does not mean that your small ruminants are free from parasites. Teeth are a good indicator of animal health as well – if the teeth are in poorer condition, it might be time to cull that individual from the flock or herd. Hooves should be trimmed and treated as needed. Ammonia levels and bedding should be checked on a regular basis as well. Ruminants tend to cluster to conserve heat, which increases the chances of injury and of parasite and disease transmission. Mites, for example, can become a problem in colder weather. In goats, check for hair loss on legs, around eyes, muzzles, and ears. If there is a mite issue, the skin may also become crusty. Water should be one of the first items to check during the winter months and should be checked twice daily. Make sure that ice is not building up in water tanks or pipes. You can use submersible heaters to prevent ice from forming or use partially buried water troughs to slow ice formation. Much like humans prefer hot drinks in the winter months, sheep prefer warm water over cold. Water temperatures in the 40’s and 50’s are preferable. Cold water can result in greater energy loss, which means that animals will need to consume more feed to make up for this loss. Water use increases during lactation and consumption of dry matter. With adequate water provided, digestion becomes more efficient. Keeping your forages healthy is also important for ruminants. Snow cover can actually provide protection for forages, allowing for opportunities for winter grazing. Longer grasses that appear through the snow take less energy to locate, whereas overgrazed pastures may require more energy for the ruminant to locate forages under the snow. Winter injury is also a concern – younger stands tend to fair better in harsh conditions than older stands, and overgrazed stands are more susceptible to winter injury. Good pasture management for ruminants can extend the grazing season well into winter. Up until now, I have focused on extreme cold winter weather. But what effect do abnormally warm winters like last year have on our ruminants? As our climate warms, ruminant producers may face more challenges with pathogens and parasites, such as with barber pole worm, a common internal parasite of sheep and goats. What about the effect of late spring frosts on our forages? How will our animals be affected? These are questions we will need to keep in mind in the future. Posted by Braden Campbell at 8:00am January 29, 2018 Posted in Management and tagged Forages and Pasture, Health, Management, Nutrition. Bookmark the permalink.